A brand new jet featuring cutting edge technology takes to the skies with great fanfare and then, inexplicably, starts falling out of the air, killing everyone on board. The public is understandably horrified, worried whether the plane is safe to fly in. Then, as experts scramble for answers, authorities take the dramatic step of grounding the aircraft. A week after the fatal Ethiopian Airlines crash, and five months after a Lion Air jet plunged into the ocean, that’s the nightmare seemingly facing the Boeing corporation with its 737 MAX 8. Despite claims otherwise, Boeing’s decision to ground its fleet is far from unprecedented in the aviation industry. Almost 70 years ago, a similar scenario unfolded for another aircraft manufacturer — Britain’s De Havilland company. Flinders University Airborne Research Australia’s chief scientist Professor Jorg Hacker said in 1952 the British firm had just introduced the world’s first commercial passenger jet — the Comet. “It was incredibly exciting, it was so much quieter and so much smoother to fly in compared to a piston-engine plane,” he said. Undeniably glamourous, the sleek new Comet quickly attracted something of a celebrity clientele. In 1953, on a special flight put on by De Havilland, Queen Elizabeth, the Queen Mother and Princess Margaret became the first members of the Royal family to fly on a jet-powered plane. “The Comet was really a huge step. I think the next comparable type of step in aviation was with the Concorde,” Professor Hacker said. “The British had outdone the Americans, demonstrably, by getting a passenger jet flying first. The Comet’s glow started diminishing soon after entering service. In two separate accidents, Comets failed to get airborne, overshooting the runway and crashing. One of the planes was on its delivery flight, scheduled to be the first Comet to operate in Australia. Pilot error was blamed in both cases, but Professor Hacker argued the root cause was the unfamiliarity of the aircraft’s new technologies. “You can call the first two accidents pilot error, but I think a better way to describe it is that people just didn’t know,” he said. “The plane had a nasty habit, if you brought its nose up too early in take-off it induced drag, and it couldn’t reach take-off speed. However, far more catastrophic failures awaited the Comet that would perplex experts, and send the plane’s designers back to the drawing board. In 1954, just a couple of months later, another two Comets disintegrated mid-flight over the Mediterranean Sea. “The whole plane, in both incidents, just disintegrated completely within seconds, starting with the cabin structure,” Professor Hacker said. “After the first crash, [investigators] had an inkling that the fuselage had exploded for whatever reason, so they put one of the prototypes into a huge water tank and pumped it full of water — up, down, up, down for many, many cycles. Professor Hacker said it took quite a while before the test Comet in the water bath revealed the secrets behind the crashes — the then little understood phenomenon of metal fatigue, exacerbated by the shape of the plane’s windows, and the riveting techniques used in construction. “At the time there were hardly any pressurised airplanes, and none that flew to the height of the Comet with that stress on the fuselage … people just didn’t know what cycles of continuous pressurisation and depressurisation meant for metal,” he said. “You can’t really blame them because it was completely new technology, it was far beyond what engineering experience was at the time. Professor Hacker said once the design issues were addressed, the Comet became a safe plane. However, the aircraft would never realise the ambitions the British had held for it. 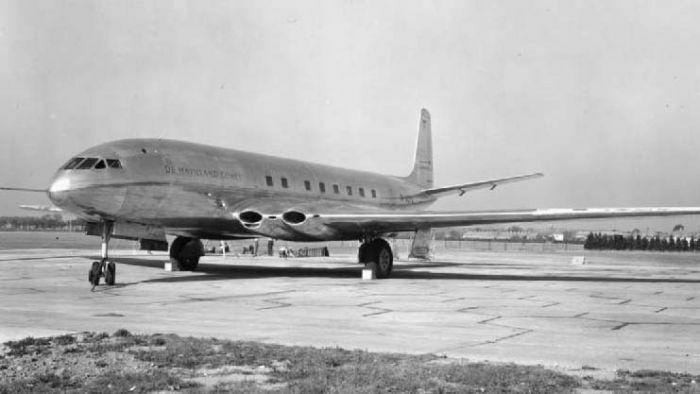 By the time the revised Comet took to the skies, De Havilland’s advantage had gone — the company soon ceased to exist as an independent entity. Boeing had introduced its much bigger 707, and was well on its way to becoming the dominant manufacturer of commercial passenger jets. Professor Hacker said the Comet did help make air travel safer for everyone, contributing to a legacy of how plane crashes are methodically and dispassionately investigated. “The good thing in the airline industry is that the first focus is on what went wrong, what can be learned from that and how can we do things better, that’s so everyone can talk openly,” he said.